Invite your friends to Thousand Trails via email, or share your referral code on Facebook or Twitter. When you send a friend $100 in Thousand Trails Camping Pass credit, you'll get $50 when they purchase and $100 when they upgrade. Not a Thousand Trails member? Sign up. 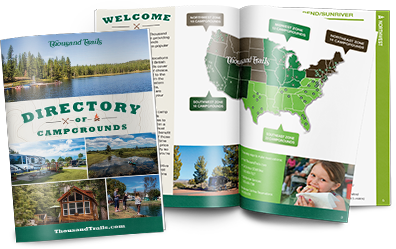 Through December 31, 2019, for each Eligible Referral (as defined) who purchases a Thousand Trails Camping Pass you will receive a $50 Visa® Prepaid Card, and for each Eligible Referral (as defined) who purchases a membership upgrade product with a price equal to or greater than $1,995, you will receive a $100 Visa® Prepaid Card. In addition, for each Eligible Referral through December 31, 2019, you will receive one entry in a drawing for the following prizes: (i) Grand Prize is either a trip to Hawaii or a 7 night Caribbean Cruise, valued at $4,000, that includes roundtrip coach airfare for two adults from the continental United States to either Hawaii or Florida, and one hotel/cruise room for 7 nights; (ii) Second Prize is a trip to either Las Vegas, San Francisco or Orlando, valued at $2,000, that includes roundtrip coach airfare for two adults from the continental United States to either Las Vegas, San Francisco or Orlando and one hotel room for 4 nights and (iii) ten (10) Third Prizes waiving payment of the winners’ annual dues for 2020, not to exceed $585 each. The trips do not include taxes, meals, beverages, transfers, gratuities, activities and other personal expenses. Prizes cannot be exchanged for cash. The drawing will be held at our corporate offices on or about January 7, 2020. The winners will be notified by telephone. The odds of winning a prize depend on the number of entries and are not expected to exceed 1:10,000. For this promotion, an Eligible Referral is a person who (i) purchases from us a new Thousand Trails Camping Pass or membership upgrade product with a sales price equal or greater than $1,995.00 between January 1, 2019 and December 14, 2019, and (ii) lists you as the referring member. This offer is only for members in good standing of Thousand Trails and its affiliates. Due to legal restrictions, (a) residents of AZ, FL, NV, and PA are not eligible to participate in the drawing and you will not receive an entry in the drawing for purchases made by residents of AZ, FL, NV, or PA, and (b) residents of AZ and PA are not eligible to receive a Visa® Prepaid Card and you will not receive a Visa® Prepaid Card for purchases made by residents of AZ or PA. We reserve the right to extend, modify, suspend, or terminate this promotion at any time for any reason; however, any rewards earned prior to the suspension or termination of this promotion will be honored. Employees of Equity LifeStyle Properties, Inc. and its affiliates are not eligible to participate in this promotion. All local, state and federal income taxes are the responsibility of the recipient. Accordingly, we recommend that all participants consult a tax adviser about reporting rewards for tax purposes. We will issue the required 1099 to each participant and to the IRS when the total value of awards you are eligible to receive equal or exceed $600 for one year. This advertising is being used for the purpose of soliciting sales of resort campground memberships. This document has been filed with the Department of Licensing, State of Washington, as required by Washington law. Value, quality, or conditions stated and performance on promises are the responsibility of the operator, not the Department. This filing does not mean that the Department has approved the merits or qualifications of any registration, advertising, or any gift, prize, or item of value as part of any promotional plan. This promotion is sponsored by MHC Thousand Trails Limited Partnership, Two North Riverside Plaza, Suite 800, Chicago, IL 60606.